The lifting magnet MaxX 250 features a fixed hook and can hold loads of up to 250 kg. 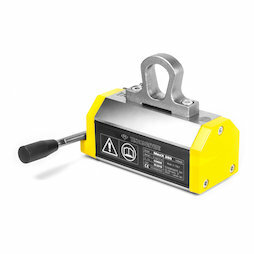 Due to its compact size and low weight, this lifting magnet even works in tight spaces. The MaxX 250 is suitable to lift flat and round stock, raw or processed material. Uneven surfaces are not a problem either. The lifting magnet is designed to keep workpieces in shape and not deform or damage them. You activate or deactivate the lifting magnet by turning over the lever. When activated, the lever is locked with a safety device so the magnet cannot be deactivated by accident. The scatter-free magnetisation ensures a concentrated magnetic force where it is needed, hence, the lifting magnet cannot attract surrounding ferromagnetic material by accident. The lifting magnet MaxX 250 stands out with its powerful and continual performance. Please note the table regarding the permissible material features and read the instruction manual before using the lifting magnet for the first time. Appropriate protective equipment is required. Lifted objects must not left hanging permanently and unattended. People should never walk under lifted weight.